By accurately re-creating the jumbled wireless signal environment of a city business district in a special indoor test facility, researchers at the National Institute of Standards and Technology (NIST) have shown how the wireless industry could lop hours off the process of testing the capabilities of new cellular phones. The NIST techniques also could simulate complex real-world environments for design and test of other wireless equipment. As described in a forthcoming paper,* NIST researchers conducted tests in downtown Denver, Colo., to measure precisely the clustering of signal reflections from radio waves bouncing off one or more multi-story buildings multiple times before reaching a distant receiver. The researchers replicated this environment indoors using a "reverberation chamber," a room with highly reflective surfaces and a big, slowly rotating paddle that automatically alters signal paths. First, researchers feed a wireless transmitter's signal into a device called a fading simulator, which is adjusted to re-create the timing and strength of the reflections of an outdoor urban area. The output then is fed into the reverberation chamber, where signal reflections decay exponentially over time, creating a cluster of signals similar to that observed in the field tests. Industry certification of cell phones currently requires tests of parameters such as total radiated power using the opposite of a reverberation chamber, a room called an anechoic chamber that is lined with materials that absorb radio waves and reflect as little as possible. 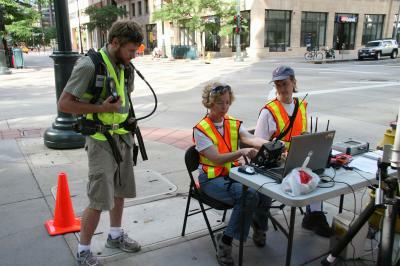 This testing takes about a day, requiring dozens of measurements of cell phone directional power from multiple angles. By contrast, an equivalent set of tests could be performed in about an hour in a reverberation chamber, according to NIST engineer Kate Remley, a senior author of the new paper. Reverberation chambers also could be used to measure cell phone receiver sensitivity, although currently there would be no time savings for this test, Remley says. Many industry testing practices are established by CTIA-The Wireless Association, the trade group representing the wireless industry. NIST is studying new applications for reverberation chambers, which have typically been used to measure electronic equipment's immunity to radio-frequency interference. By adjusting the reflectivity of the chamber through selective use of signal-absorbing material, researchers have found they can "tune" the signal decay time to simulate the conditions found in real-world environments. NIST researchers expect the new method will be useful for test and design of wireless devices such as cell phones, notebook computers equipped with wireless links, as well as new technology such as wireless beacons being developed for the emergency responder community. The Denver tests were conducted in 2009. NIST researchers measured the power delays between a transmitter and a distant receiver positioned on streets lined with buildings three floors high or taller and a flat, single-layer parking lot. Most buildings were constructed of glass, steel, and concrete.